Should a lunchtime table booking be considered like a plane, i.e. arrive in plenty of time, a train, i.e. arrive just in time, or the Bawdsey ferry, i.e. all timings are approximate? Me, I'm the ferryman. My rather lackadaisical approach to timekeeping -- witness this piece from 100 months ago -- was found to be, erm, at odds with my dining partner. There were "words". Let's (eventually) agree to draw a line underneath it, shall we? Word was that the peeps who once had Mortimers (fab fish joint, now Bistro On The Quay) were looking for a new place. 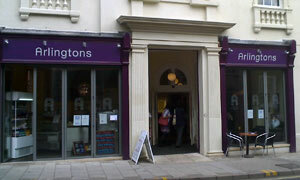 Word is that they found it: welcome to Arlingtons on Museum Street, and what a building. Previously the Ipswich School of Ballroom Dancing, and for those with fictionally long memories, the original museum, opened 1847. Wasn't that long ago when this structure was in a right old 2-and-8, as seen in this 2005 photo. They none too concisely term themselves a "cafe-bar & brasserie with deli takeaway": most bases covered there. We headed upstairs to the poshest bit, and were asked if we'd like to sit downstairs or up in the gallery. Up we go! From our seat in the gods, we could gaze down upon the mortals below, absently helping ourselves to iced water and crusty bread. Everything on the brasserie menu sounds appetising, from the starters to the chargrill, AND there's kids' options too. For me, the salade nicoise -- literally a nice salad -- love that tuna / olives / beans combination. Did I mention the nearby mezzanine piano? Nobody tickling the ivories today. All feels tres chic in here, aided by the countless b&w French pix on the walls. They're open all day and, should your plastic stretch to it, you could happily consume three square meals in this relaxed ambience. Greatly looking forward to trying out the cafe-bar part. If I was still working in the town centre, I'd be a regular. If it was a car -- Aston Martin V12 Vantage. If they were passing by -- Ben Stiller.